Teatras | Puslapis 3 | Radikaliai kitoks požiūris į kultūrą. Teatras Vilniaus Kamerinis teatras (VKT) rugsėjo 17 d. naująjį sezoną tradiciškai pradės Evaldo Jaro režisuotu nuotaikingu spektakliu visai šeimai „Plėšikas Hocenplocas“. Teatras This text was written specially for radikaliai.lt. 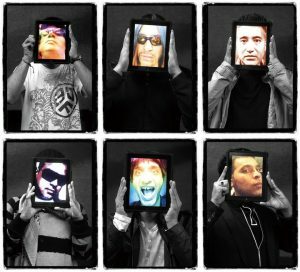 ADF's Steve Chandra Savale: "The music itself must be sonically radical in its approach"
London based band Asian Dub Foundation (1993-, electronica, rapcore, dub, dancehall, ragga) changed life of many. Steve Chandra Savale-Chandrasonic - guitarist/lyricist/producer - also composed and co-wrote the musical Gaddafi: A Living Myth with the Asian Dub Foundation and has presented a series of documentaries for Al-Jazeera English called Music of Resistance. The Music of Resistance is a six-part documentary series that tells the stories of musicians who fight repression and sing about injustices. They are unique musical personalities from some of the world's most troubled areas - what makes them different is their need to communicate their politics through music. They are all ambitious and talented but for them 'making it' is not about diamonds and sports cars - it is about radical political change. They come from Nigeria, Mozambique, the favelas of Brazil, Cape Verde, the desert of the Sahara and London. Savale has interviewed prominent leftist intellectual, historian, political campaigner, author, and filmmaker Tariq Ali about the War on Terrorism, Pakistan, 1960s musicians and their activism, and health care in the United States. Steve Chandra Savale answers to some questions. Mindaugas Peleckis. Nació en Siauliai, Lituania, en 1975. Poeta, escritor de prosa, ensayista, periodista y traductor. Desde el 2008 es miembro de la Unión de Escritores de Lituania (LWU). Creador de la revista cultural www.radikaliai.lt. Publikuojame dar vieną įdomų Thomas Bey-William Bailey straipsnį, kuriame jis nagrinėja orvelišką kompiuterinių žaidimų ir tikrovės sampratą. Thomas Bey William Bailey (www.tbwb.net) is a psycho-acoustic sound artist and writer on saturation culture. Working with a number of different communications media, TBWB aims to construct a body of work that interrogates notions of utopia, anthropocentrism, and "the extreme," while refusing to reject any unpopular cultural manifestation as invalid until its more nuanced aspects have been brought to light. An admitted autodidact, TBWB draws upon the work of a diverse body of 20th and 21st century thinkers to aid him in a personal quest for 'serious playfulness': Johan Huizinga, John Gray, Friedrich Kittler, Paul Virilio, Gilles Deleuze, Gregory Bateson, and numerous others all contribute to TBWB's jargon-free, non-specialist writings on creative life. As a sound enthusiast, he takes his cues from composers such as Iannis Xenakis and the new contingent of computer-aided 'glitch' artists: those with no apparent fear of using the full spectrum of audible sound to produce rapturous or ecstatic moments of deep personal inquiry. As of June 2011, TBWB acted as researcher in residence at The Sound Archive Of Experimental Music And Sound Art in Murcia, Spain. His newest book is "Unofficial release: self-released & handmade audio in post-industrial society". Here its author gives us a very interesting journey into phenomenon of synesthesia. Medicinos mokslų daktaras (MD) Bernardas Lownas gimė 1921 m. Utenoje, o būdamas trylikos su tėvais emigravo į JAV, kur iki šiol gyvena. Jis - ne tik defibriliatoriaus išradėjas, bet ir pasaulinio garso kovotojas už taiką. Tai - vienas nedaugelio Lietuvos nobelistų ir bene vienintelis lietuvis taikos nobelistas: 1985 m. jo su bičiuliais įkurta organizacija Tarptautiniai gydytojai už branduolinio karo prevenciją buvo apdovanota Nobelio taikos premija. Publikuojame širdies ir taikos specialisto straipsnį apie Ameriką, B.Obamą ir jo Nobelio taikos premiją. Manome, kad dabar ši tema, bręstant naujiems karams, kaip niekada aktuali. Spausdiname vieno žymiausių lietuvių filosofų, profesoriaus emerito Algio Mickūno straipsnį anglų kalba. Radikaliai! pastoviai spausdins užsienio ir lietuvių autorių kitakalbes publikacijas - intelektui lavinti, tarpkultūriniam dialogui palaikyti. Skaitytojų pageidavimu, kitakalbiai tekstai vėliau bus išversti.